Summer is all but over but that does not mean I need to stop drinking ice tea. It is refreshing and the fact that I use rooibos tea, means that it is healthy as well. I was recently invited to attend an event hosted by Freshpak where we were served cold teas and a selection of canapés made with rooibos. Rooibos translates to red bush and the tea is full of anti oxidants. I have used it before on the blog when I made my Rooibos and Lavender Tea Sorbet. Rooibos is a fynbos and is indigenous to South Africa. At the event we were shown how to make a base drink and to this base you can add any flavour you choose. How about some frozen berries, cooked down to a syrup and then passed through a sieve? Or some lime juice and fresh mint leaves? The possibilities are endless. From the lovely gift box I received, I made my own pomegranate ice tea. What is your favourite ice tea flavour? Disclosure: I was invited to the Freshpak event and I was not asked to write a blog post about my experiences. This post is in line with my blogging policy. Great addition with the pomegranate! I look forward to hearing if you enjoy the tea! Iced tea season is just around the corner on my side of the globe. Your pomegranate ice tea sounds perfect for the sweltering New York summer. Spring is just starting here, and I love the idea of having this refreshing beverage in the summer heat! Great tea recipes Tandy, been wanting to try rooibos tea for ages. Thanks! This looks delicious! So refreshing. My favorite flavor of iced tea is lychee. It’s actually cold brewed, and so good! Your ice tea looks fabulous Tandy. 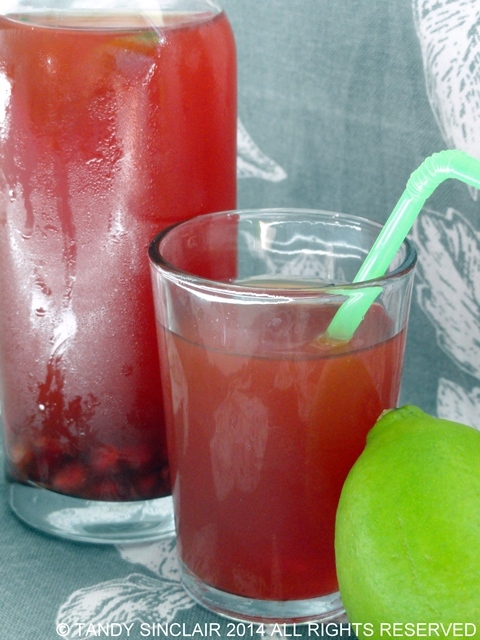 Your pomegranate ice-tea looks very refreshing & ideal for the weather that we are having today: 23 °C. Ooh yes! I love home-made rhubarb orange & ginger tea in full Summer. And at least you know there are only fresh ingredients in it! Delicious – now the weather is warming up in Spain I should start making this! We make a lot of sun tea in the summer. Usually green tea with ginger and honey. I like that you used rooibos tea in yours. I like teas that are naturally caffeine-free so I can enjoy the tea with dinner. Is this not amazing that we are having such high temperatures this time of the year 🙂 It can stay till we head overseas!